Last Sunday my husband and I drove two hours to Tucson to see The Man Who Invented Christmas. I don’t know why the local theaters weren’t showing it, but we were determined to watch this movie that I am sure will become a holiday classic since it is about how Charles Dickens came to write A Christmas Carol. My favorite scenes all have to do with how Dickens found inspiration in everyday encounters. In the movie, his last three books have flopped. He’s strapped for money and needs a hit, but he doesn’t have a wisp of an idea. Then one night he overhears the new Irish maid telling his children stories about how on Christmas eve, the veil between our world and that of the spirits is thin enough to allow them to slip through to our side. That sets Dickens’ imagination whirling and the idea of new story is born. After that Dickens picks up bits of real dialogue, he meets people who inspire characters, and he comes upon situations that inspire events for his novel. But the most intriguing element of the movie is how Dickens and the characters talk to each other. As Dickens is trying to finish the last chapter, he wants to leave Scrooge as an unrepentant miser. His characters “won’t do what I want them to.” They rebel. They keep telling him that Scrooge can be redeemed. Even his Irish maid tells him that the end of the book needs to be hopeful. That’s when we get a glimpse into Dickens’ childhood and how his life inspired his stories and activism on behalf of the poor. His father was an upper class working man, but he had no idea how to manage money, and so was arrested and put into debtors prison, along with his family. Charles, however, was forced to work in a boot blacking factory at the age of twelve. The conditions in the factory were harsh and Dickens never forgot what it was like to lose everything and be treated as if he were a commodity. So, as he’s writing A Christmas Carol, he must face the fact that he has never forgiven his father for that humiliation. I know that every author has their own method and personal viewpoint. 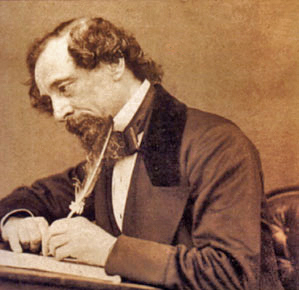 Charles Dickens wrote his books in serial form, changing his characters and plots as he heard his friends and readers talk about the latest installment. However, he started with a firm beginning middle and end in mind. And because of his childhood experiences, almost all of his books had to do with the inequity between the rich and poor. Sometimes I wish I was more like Dickens. When I began writing The Space Between Time, I only had a vague idea of my characters, themes, and where I wanted my story to end up. I don’t have conversations with my characters, as the movie portrays Dickens doing. But, I do get ideas just as I’m waking up, or some little snippet of plot will slink by me as I’m doing something else. Sometimes I get inspiration while I’m driving. When that happens I tell the ideas to stay put so I can write them down, or commit them to memory for later use. But like Dickens, my past and how I feel about it, is all part of my written work. I think it must be that way for all authors. I can’t say I’ve ever had writer’s block, as Dickens does in the movie, at least not yet, thank heaven. But there are times when I know that where the story and characters want to go isn’t quite ripe yet. So I have to let the ideas simmer on the back burner of my mind. Or maybe it’s more a matter of me giving up resisting where the characters need to go. While writing The Space Between Time, I wanted to make my characters perfect, spiritually awakened people. But we all have those dark places inside that we must face to get through to the light. For me, dredging up the dark emotions are the hard days of writing. Fortunately I have good writer friends who keep reminding me that the best stories show the character’s struggles before they find a happy plateau. Not being a person who plots out every event in the book is sometimes a pain. But that’s just not my personality. When I began writing this first novel, part of my vague idea was to have two intertwining timelines, but when I picked it up again after several years, I couldn’t figure out how to do it. Then a fellow author encouraged me to go with my first instinct. On the drive home I just said to the universe, “Okay, I want to tell the story of a character in the present and have her discover a character in the past. As a result they learn from each other. How do I do that?” And as I was approaching the San Pedro River, the idea came to me. Jenna’s life would be shattered. She’d find Morgan’s journals and enter her consciousness. From that moment on, idea after idea flowed to me as the story developed. I was energized again. A similar thing happened with Time’s Echo, the sequel novel I’m working on now. Again the story in the past came to me first. I knew I wanted Morgan to become involved in the Suffrage Movement, but what was happening with Jenna in the present wasn’t clear to me. I wanted her to have some kind of awakening and become involved in advancing women’s rights, but just what was going to motivate her to do that wasn’t clear. That was in 2014. I began writing Morgan’s portion of the book and waited for events or inspiration to come to me about Jenna. I mean, I had been harassed in college and in the work place, but none of it seemed immediate enough to propel Jenna into activism. Inspiration and recent events collided with a vengeance. We’ll see how real life events help me write more of Jenna’s awakening. Like Dickens, everything that comes into my sphere of awareness is fodder for the stories I want to tell. I hope you will go see The Man Who Invented Christmas. Even if it is fantasy, it’s satisfying to think that Dickens came to understand and forgive his father. The movie is filled with hope that if we forgive, we can find joy in life and change those around us.